Dimensions: Bath Towel: 53" x 29.5"; Hand Towel: 27.5" x 16.5"; Wash Cloth: 12" x 12"
Awsome towels. Dry fast. Will get more. The linen is rich and very absorbent. They wash well. 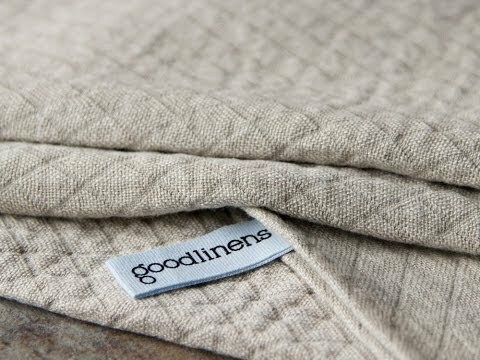 goodlinens bring all-new meaning to the words towel-dry and quick-dry. Designed by JoAnne Chirico as an eco-friendly alternative to cotton terry towels, goodlinens are made in Lithuania of 100% linen derived from the flax plant. Why linen? Because linen is highly air-permeable and naturally bacteria-resistant. By air or by machine, goodlinens dry surprisingly fast. They also take up less room in your washer, dryer, and linen closet than ordinary towels. 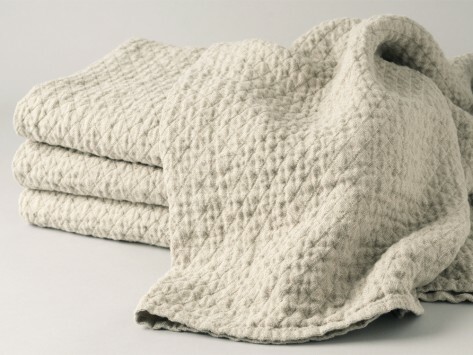 Wonderfully textured and absorbent, the beautiful diamond weave double-layer design adds sophistication to your bathroom and provides a gentle exfoliating feel for your whole body. Unlike traditional bleached white towels that turn a greyish, yellow color over time, goodlinens' natural colored yarns are just that—the natural color of the fibers inside the flax plant’s stalk. Before first use, wash and tumble dry low to tighten weave for maximum absorbency and optimal softness. It didn’t take long for our testers to toss their damp and dingy terry towels out with the bath water and hang goodlinens up to dry. Wouldn’t you like to give a lovely-looking, faster-drying towel a try?